2011 ADCOLOR® Awards Nominations Portal Now Open! NOMINATE TODAY! Deadline for Nominations is Friday, July 1, 2011 @ 5pm! Subject: 2011 ADCOLOR® Awards Nominations Portal Now Open! NOMINATE TODAY. Deadline for Nominations is Friday, July 1, 2011 @ 5pm! Please nominate a deserving professional of color, diversity champion or companies who have risen up and reached back! The 2011 ADCOLOR® All-Star Award and The GLAAD® ADCOLOR® Professional of the Year announcement coming soon! 2011 deadline is Friday, July 1 at 5pm! For all ADCOLOR® Awards & Industry Conference information, please visit our Microsite designed by SBS Studios LLC at www.adcolor.org this coming April! The ADCOLOR® Industry Coalition is a 501(c)(6) that was founded in 2005. The AIC seeks to support, promote and inspire professionals of color and diversity champions within the advertising, marketing and media industries. As its first initiative, The ADCOLOR® Industry Coalition launched ADCOLOR® and The ADCOLOR® Awards in 2007 to honor professionals of color, diversity champions and companies who work together to further diversity & inclusion efforts in the advertising, marketing and media industries. The ADCOLOR® Award Honorees and Alumni are the trailblazers and the torchbearers for the next generation of young diverse achievers. substitute mentors. As a mentor you would have the opportunity to get to know hundreds of dedicated young professionals who care about making a difference in the lives of the next generation. Details about the program and application process are below. If you have any questions, please feel free to contact the NYNY staff at 212-571-0202 or mentors@newyorkneedsyou.org. 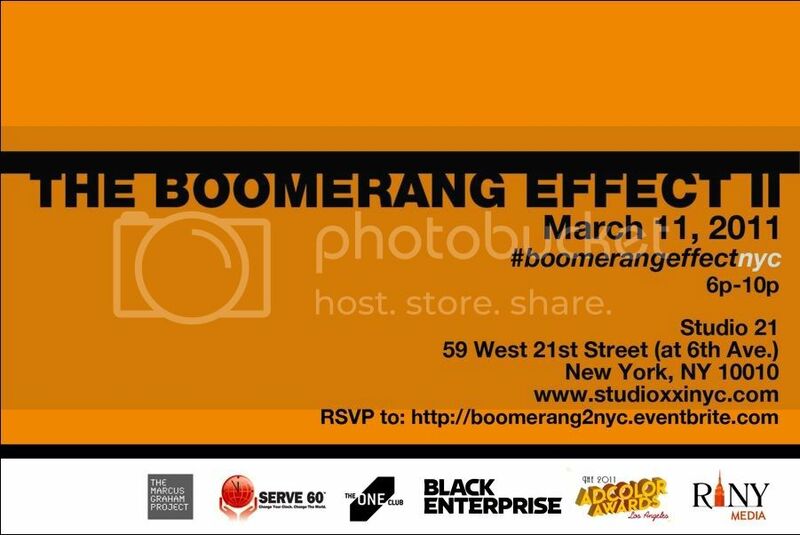 You are cordially invited to The Boomerang Effect II After-Work Tweet Up for friends, supporters & members of The Marcus Graham Project and SERVE 60(TM), celebrating the changing face of the advertising, PR and marketing industries. Join us on Friday, March 11, for an after-work networking event to kick off the Boomerang Effect weekend and building a network of the next generation of industry professionals. Twitter Topic: #FF - Follow the Leader in the Industry by sharing with the world who they should connect to on Twitter. Who's the next Marcus Graham? Who's the next Jacqueline? Visit: http://www.marcusgrahamproject.org/boomerangeffect2 for more details.